Excavation 2012 – Day #14 – Damn You Infomercials. Damn You! I’ve already written at length about the fact that I am a bit of a sucker when it comes to infomercials (click HERE if you need a refresher). I don’t know what it is. There’s just something about those fast-talking endorsements that make even the most ridiculous products seem not only plausible, but downright desirable. By the time they are flashing the 1-800 number up on the screen, I’m utterly convinced that my life will be completely fulfilled and a whole lot simpler if I can just get my hands on a Slap Chop or a Slushy Magic or the Smooth Away Hair Removal System. Well, maybe I’m not completely convinced, but I am curious enough about the products to spend a few bucks when I happen to find them in the bargain bin at my local Walmart or Bed Bath & Beyond. And while there have been a few hits–like the Perfect Pancake and the Sham-Wow–there have also been a few big misses. 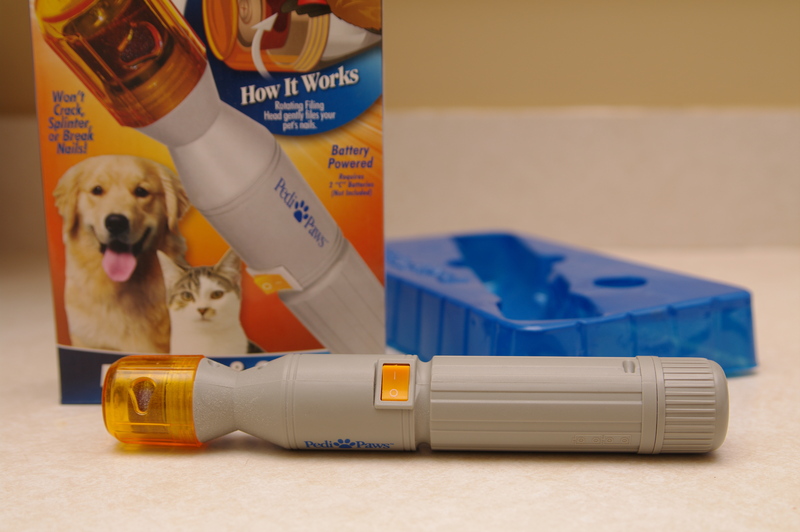 In theory, this product is brilliant. When you own a dog like Electra, whose sleek coat requires very minimal grooming, there is little reason to fork out a lot of money to take her to a professional groomer. The only reason we ever paid a professional in the first place was because I was scared to try and clip her toenails on my own. 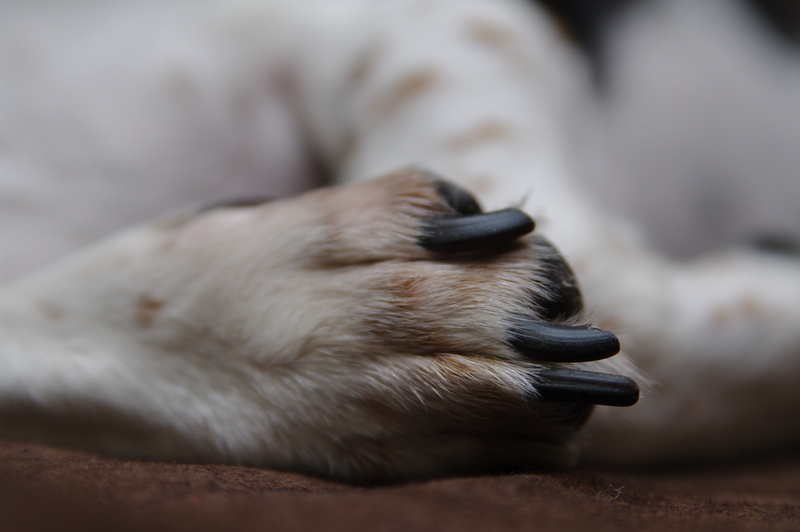 Electra doesn’t just have toenails, she has large multi-colored raptor claws. Some are whitish and sort of opaque and some are thick and black, making it nearly impossible to be 100% sure where the quick is. 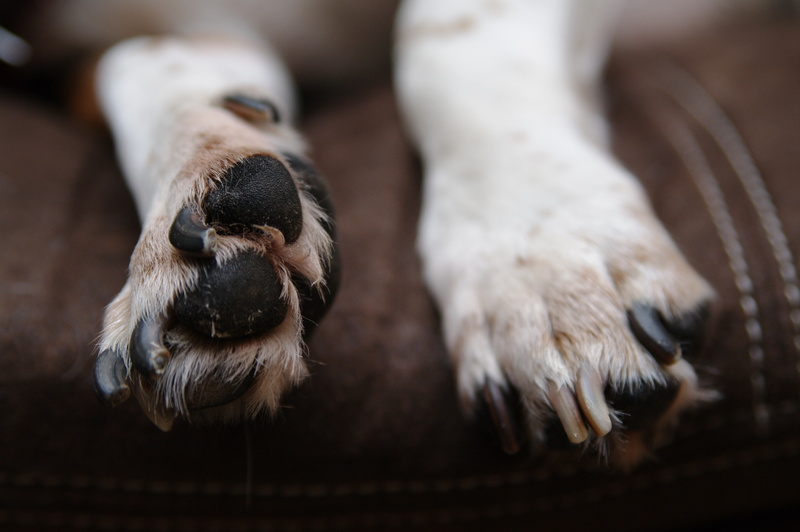 Her nails belong on an animal much larger, a Saint Bernard or a rhinocerous perhaps. I think my fear of becoming Electra’s personal pedicurist might have something to do with the fact that our sweet hound walks around with a face so mopey you’d swear she suffers from canine clinical depression. Deep down, I know that is just a byproduct of being half-basset. But there’s just something about that sad, droopy face that makes me fear that she just might never forgive me if I accidentally hurt her by cutting one of her nails too short. And if there was actually any blood involved, I would never be able to forgive myself. The infomercial made it look so simple, and it guaranteed a no-pain alternative to nail-cutting. I figured it was worth a try. 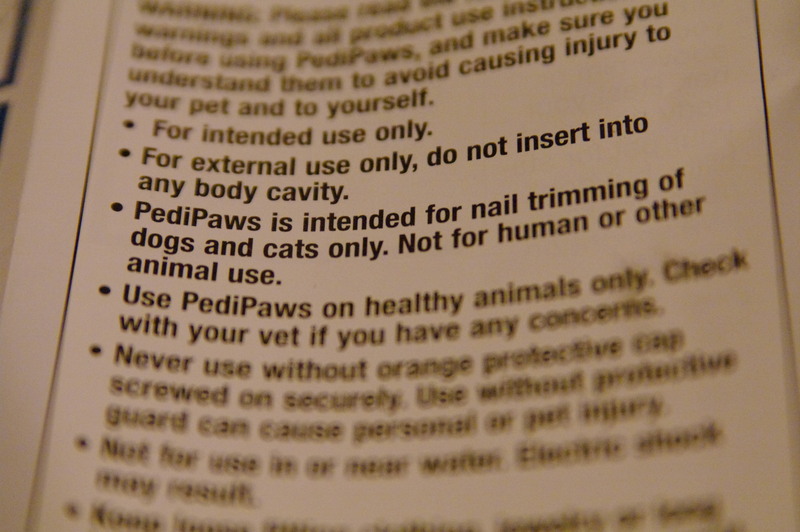 Problem #2 – While the Pedi-Paws might actually be useful on a cat or a chihuahua or another animal that has small, manageable nails, the only thing that is really going to work on Electra’s talons is a high-powered belt sander. 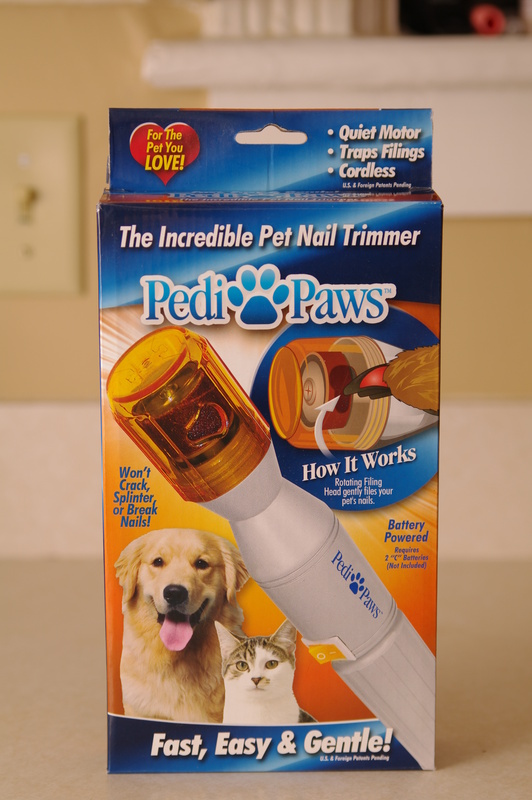 Roughly 30 seconds and 2 toenails into our first attempt with the Pedi-Paws and we were already replacing the rotating emery head. Not a good first impression. We gave it a few more tries, just to make sure there wasn’t some secret we were missing, but the final conclusion on this one is that it’s not even worth the batteries inside it. Destination = trash. 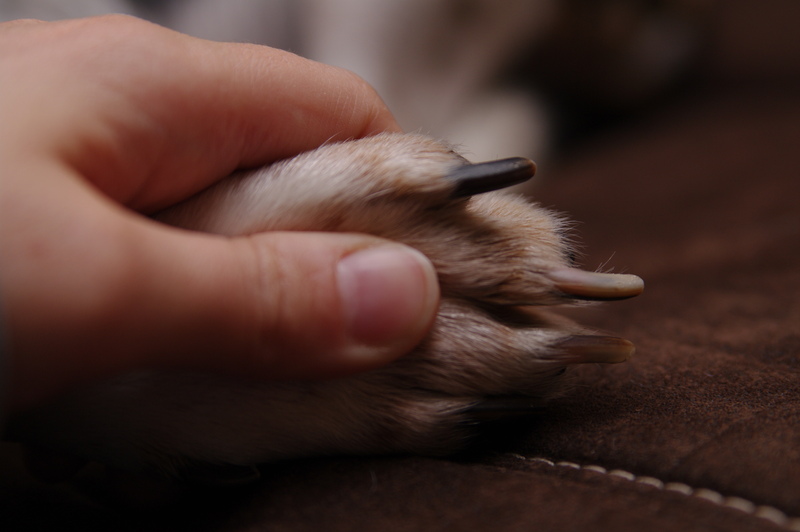 I wasn't sure whether this guy was trying to keep the dog still for a pedicure or get to second base. Either way, epic fail. 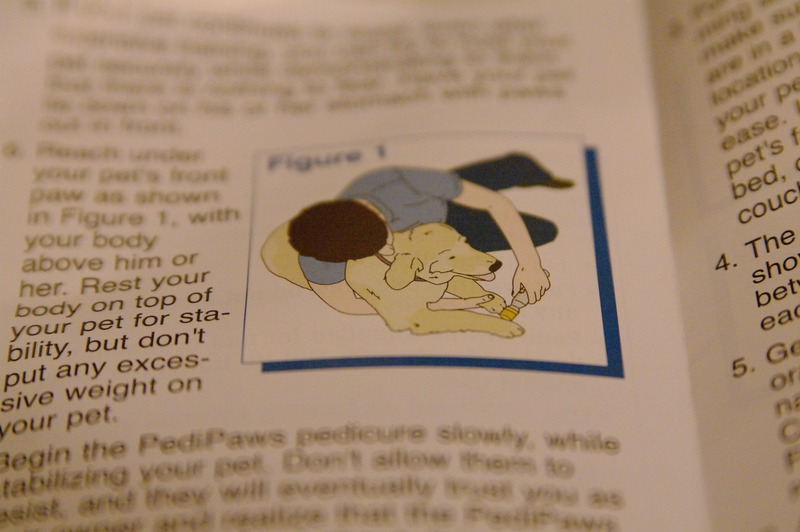 And just a little additional instruction on how to subdue your dog for his pedicure. Be sure to take a second look at the illustration above ^^ and use your imagination for how it might look working on the back paws. Too bad they didn't include a separate illustration for that. 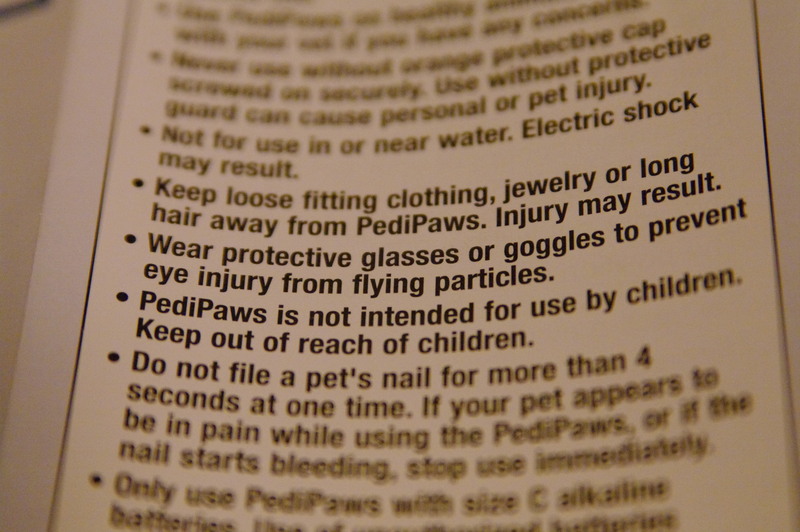 Any mani/pedi product that requires you to wear protective goggles is doomed to failure. Don't use on humans. Check. Don't insert into body cavities. WTF? Sadly, you know the only reason the manufacturers had to put that in the manual was because some ignoramus actually tried it.